Citation: Ward KW, Grubbs K, Biswas A (2018) Awareness and Knowledge of Cochlear Implants among Speech-Language Pathologists. Health Sci J Vol.12.No.4:583. Copyright: © 2018 Ward KW, et al. This is an open-access article distributed under the terms of the creative commons attribution license, which permits unrestricted use, distribution and reproduction in any medium, provided the original author and source are credited. Speech-Language Pathologists work closely with individuals who have received cochlear implants across a multitude of settings which include early childhood education centers, schools, hospitals and skilled nursing facilities. However, previous research suggests that Speech-Language Pathologists do not have the adequate skills or knowledge to work with clients who have received cochlear implants. To assess whether Speech- Language Pathologists in the state of Mississippi had similar results as in the previous studies, a questionnaire was used to assess knowledge on cochlear implants. The results are consistent with previous studies which suggest that there is an overall lack in cochlear implant competency, specifically on identification of the components of a cochlear implant and knowledge of cochlear implant resources. The knowledge of service providers in healthcare as well as educational settings is crucial to the outcome of the patients/ students. When working with individuals who have received cochlear implants, it is vital that all service providers are knowledgeable regarding the use and care, troubleshooting, and device function. Typical service providers for this population may be nurses, audiologists, educators, and Speech-Language Pathologists. Speech-Language Pathologists work closely with individuals who have received cochlear implants across a multitude of settings which include schools, hospitals, and skilled nursing facilities. However, previous research suggests that Speech-Language Pathologists do not have adequate skills or knowledge to work with clients who have received cochlear implants [1-4]. To assess whether Speech-Language Pathologists in the state of Mississippi had similar results as in the previous studies, a questionnaire was used to assess knowledge on cochlear implants. The results are consistent with previous studies which suggest that there was an overall lack in cochlear implant competency, specifically on identification of the components of a cochlear implant and knowledge of cochlear implant resources. Participants were licensed Speech-Language Pathologists in the state of Mississippi, who possessed a minimum of a Master’s degree, and voluntarily participated. Participants ranged in years of experience, gender, place of employment, age, and location within the state of Mississippi. Demographic information of the participants appears to be representative of the distribution of Speech-Language Pathologists from across the state. 68 participants chose to participate in this study by completing a questionnaire disseminated through the state association email system, yielding a 23% response rate [5,6]. Data was analyzed using Qualtrics software and SPSS with procedures such as ANOVA (details presented in a subsequent paragraph) and Spearman’s rho Nonparametric Bivariate Correlations approach. Statistically significant negative correlations were observed between age vs. coursework on cochlear implant (r=-0.425, p<0.01), between age vs. adequate coursework (r=-0.272, p<0.05), between years of experience as SLP vs. coursework on cochlear implant (r=-0.334, p<0.01). Statistically significant positive correlations were observed between adequate coursework and knowledge of cochlear implant hardware (r=+0.290, p<0.05), between number of clients vs. coursework on cochlear implant (r=+0.299, p<0.05), between age vs. years of experience (r=+0.874, p<0.01), between age vs. coursework on cochlear implant (r=+0.548, p<0.01), between number of seminars attended vs. knowledge of cochlear implant hardware (r=+0.349, p<0.01) [7-9]. Demographic information such as age, years of practice, location of practice and number of students previously served with hearing loss, or population of clients yielded no statistically significant results regarding cochlear implant awareness and knowledge. Questions related to comfortability in troubleshooting a cochlear implant processor, completing a daily listening check, completing a Ling-six sound test, changing the cochlear implant battery, utilizing a FM system with a cochlear implant, and connecting the cochlear implant to a computer for streaming purposes were presented. The participants rated each of these tasks from extremely uncomfortable to extremely comfortable on a Likert scale. The results for this section are presented in Figure 1. Figure 1: Participant comfortability on cochlear implant related tasks. Responses to personal strengths and weaknesses in qualitative form revealed the following responses: “not having a strength”, “completing listening checks”, and “understanding the components of the device”, “troubleshooting”, “not enough experience or exposure”, “parts of the cochlear implant”, and “creation of therapy goals for one with a cochlear implant”. In the next task participants were asked to label parts of both internal and external components of a cochlear implant. The six components presented for labeling were: (1) speech processor, (2) battery compartment, (3) transmitting cable, (4) transmitting coil, (5) receiver or stimulator, and (6) multielectrode array. The results are presented below in Figure 2. The results suggest the majority of participants were familiar with only the battery compartment and the transmitting cable (91%). However, less than 40% of the respondents were successful in identifying other important components such as the speech processor, transmitting coil, receiver or stimulator, and the electrode array [9-13]. 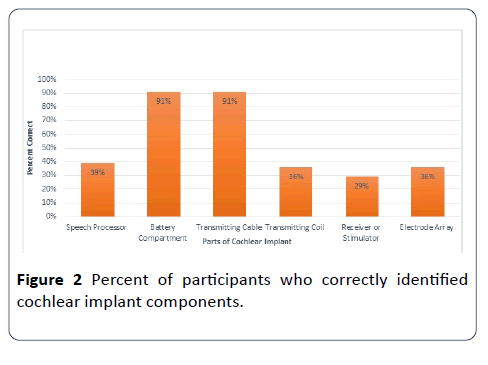 Figure 2: Percent of participants who correctly identified cochlear implant components. To summarize the data in a compact form, a new variable named ECS (Expressed Competency Score) was computed from a sum of standardized scores on seven selected questions, including the number of clients with hearing loss, the volume of relevant coursework, adequacy of relevant coursework, ability to change battery of a cochlear implant, attendance of relevant seminars, ability to identify components of a cochlear implant, and the level of communication with audiologists. The score on each of these variables was scaled such that the lowest score received by any participant on the question was scaled to zero, and the highest score received by any participant on that question was scaled to 15. Therefore, the maximum possible ECS score on the seven 7 selected questions was 7*15=105. The distribution of the Express Competency Score approximately conformed to the normal distribution, as shown in the following Figure 3. The average score of the participants was only 37 out of 105 maximum possible score. Analysis of Variance (ANOVA) was performed for Express Competency Scores as a dependent variable against the years of experience of SLPs as a categorical grouping variable. There was no statistically significant difference between the groups at significance level (p>0.05). 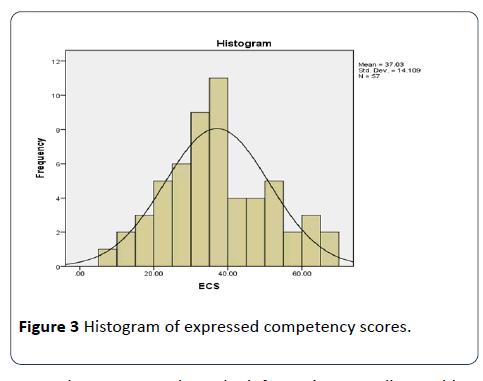 Figure 3: Histogram of expressed competency scores. In order to assess where the information regarding cochlear implants would have been obtained by Speech-Language Pathologists, the researchers inquired about coursework in graduate, post-graduate, and undergraduate educational coursework realm of the participants. Overall results show that about 50% of the participants did not receive any formal training in undergraduate, graduate or post-graduate coursework. For those participants that did, it appears majority of the coursework was primarily in the graduate realm, none of the participants reported having any coursework on cochlear implants in the doctorate realm. Furthermore, when asked how adequate the coursework was at any level, about 50% of the participants rated their coursework as mostly inadequate. In addition, about 50% of the respondents reported they relied upon attending seminars and presentations to obtain such information. If the information is being obtained from other sources than formal education settings, the researchers wanted to know where the majority of Speech-Language Pathologists received training. The researchers set out to find how much communication is occurring between audiologists and Speech-Language Pathologists in regards to cochlear implant management. Even though most of the participants recorded that they rarely communicate with an Audiologist, when asked how important they felt communicating with an Audiologist, the results were significantly different. About 63% (42) of the participants stated that communicating with an Audiologist was important, while 22 reported very important, 1 moderately important and 1 reported slightly important. The last question of this section asked the participants who they called when having a question about cochlear implants and to choose all that applied. The majority reported they would contact an audiologist (51) while 3 reported a nurse, 9 reported a Speech-Language Pathologist, 12 reported an Ear, Nose, and Throat Physician, 2 reported client’s spouses, 23 reported the client’s parents, 2 reported a teacher, and 7 reported “other.” Results are demonstrated in Figure 4. 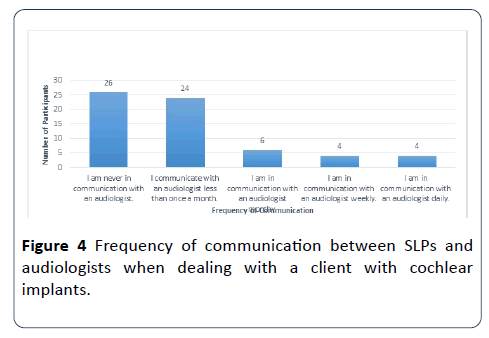 Figure 4: Frequency of communication between SLPs and audiologists when dealing with a client with cochlear implants. In order to assess where other sources of information the participants use, the participants were surveyed regarding cochlear implant resources and availability. The results of where participants would turn to additionally for resources are shown in Figure 4. The majority of the participants stated that they would prefer to look for resources within books or attend seminars at continuing education conferences. For example, about 40% of the participants selected, “I am never in communication with an audiologist”, and another 38% of the participants selected, “I communicate with an audiologist less than once a month”. Results of this study suggest an overall lack of appropriate training, educational preparation, and resources for cochlear implants that Speech-Language Pathologists feel is necessary to provide intervention to clients with cochlear implants. Many of the survey participants lack competency on a variety of cochlear implant topics such as troubleshooting, completing a Ling-six sound test, parts of a cochlear implant, and general maintenance. To begin to remedy these results, it is suggested that more hands-on seminars at continuing education conferences, in the undergraduate classrooms, and the graduate level coursework be implemented. Participants expressed the need for accessible cochlear implant resources to assist with treatment and these seminars will provide that training and resources for them. These seminars should be delivered by audiologists who are the experts on cochlear implants and who should serve as the primary contact for all cochlear implant related questions. One component of a cochlear implant seminar could be education on identifying the components of a cochlear implant. Many participants had difficulty identifying a majority of the components of a cochlear implant. It is important for Speech- Language Pathologists to understand the components of a cochlear implant to effectively complete cochlear implant related tasks such as troubleshooting, connecting to a FM system for streaming purposes, and completing Ling-six sound tests which are essential to educational success for children in the schools and for adults in everyday listening situations. In order for Speech-Language Pathologists to be able to educate themselves and colleagues, there must be appropriate resources available to them. Availability of resources can be crucial in education in any realm, especially when dealing with medical equipment and the ever-increasing technology improvements. With audiologists being the expert on cochlear implants, it is imperative that Speech-Language Pathologists and audiologists communicate frequently. Results from this study suggest this is not occurring within the state of Mississippi for a large majority of the participants. It is the authors’ belief that the participants in this study are a true representation of what communication is ongoing between Speech-Language Pathologist and audiologist in the state. The authors suggest that both professionals could make more of an effort to communicate when working with individuals with hearing loss. This two-way interaction will provide both professions with the most up to date cochlear implant resources in order to provide the most effective treatment. Overall, the authors felt the most surprising result was the Expressed Competency Scores (ECS) of participants (35%). The authors felt the seven questions combined to create the ECS represented a well-rounded view of what a professional working with individuals with cochlear implants should possess. Unfortunately, the Speech-Language Pathologists in the state scored significantly below 50%, which is certainly alarming considering they are working with numerous individuals throughout the state. This score is highly surprising and certainly reflects a large need for education of Speech- Language Pathologists within the state of Mississippi on cochlear implants. Furthermore, the lack of coursework reported from the participants is certainly an issue within the state of Mississippi. The authors propose revisions in curriculum to focus on cochlear implants at every educational level to ensure best practice service delivery. To implement, schools can shape their curriculum to incorporate more information on cochlear implant components, function and troubleshooting. It is imperative that Speech-Language Pathologists are knowledgeable and feel qualified to provide services to all individuals, regardless of age, to those with cochlear implants. If Speech-Language Pathologists do not feel qualified to treat individuals with cochlear implants and are not receiving appropriate training, they cannot and will not provide the most effective services for those with a cochlear implant. This is certainly an area of concern for the researchers when considering the limited knowledge of cochlear implants among Speech-Language Pathologists in the state of Mississippi. Future research and projects must be conducted and implemented in order to ensure all individuals with cochlear implants within the state of Mississippi are providing the most appropriate services. Babeu CA (2016) Preparation of speech-language pathologists to provide effective services for children with cochlear implants in New Hampshire public schools. Honors Theses and Capstones 271: 1-36. Compton MV, Tucker DA, Flynn PF (2009) Preparation and perceptions of speech-language pathologists working with children with cochlear implants. Communication Disorders Quarterly 30: 142-154. Qian-Jie F, Galvin JJ (2007) Perceptual learning and auditory training in cochlear implant recipients. Trends and Hearing 11: 193-205. Loh C, Jiang D, Dezso A, Fitzgerald O’Connor A (2008) Non-sutured fixation of cochlear implants using a minimally-invasive approach. Clinical Otolaryngology 33: 259-261. Anderson K (2015) Access is the issue, not hearing loss: New policy clarification requires schools to ensure effective communication access. Perspectives on Hearing and Hearing Disorders in Childhood 25: 24-36. Blair JC, EuDaly M, Benson PA (1999) The effectiveness of audiologists' information sources for classroom teachers. Language, Speech and Hearing Services In Schools 30: 173. Bodner-Johnson B, Sass-Lehrer M (2003) The young deaf or hard of hearing child: A family-centered approach to early education. Maryland: Paul H. Brookes Publishing. Chute P, Nevins M (2003) Educational challenges for children with cochlear implants. Topics in Language Disorders 23: 57-67. Chute P, Nevins E (2009) Serving Students with Hearing Loss in Schools. The ASHA Leader 14: 12-15. Clark G, Cowan RS, Dowell RC (1997) Cochlear implantation for infants and children: Advances. San Diego: Singular Pub. Group. Compton M, Tucker D, Flynn P (2008) Preparation and perceptions of speech-language pathologists working with children with cochlear implants. Communication Disorders Quarterly 30: 142-154. Eisenberg L (2009) Cochlear implants in children: historical perspectives and personal reflections. in clinical management of children with cochlear implants. San Diego: Plural Publishing. Watson M, Martin K (1999) Providing Services to Children with Cochlear Implants in the Public Schools: Results of a Survey of Speech-Language Pathologists. Journal of Educational Audiology 7: 1-7.